Steven Frederic Seagal, who is better known in show business as just Steven Seagal, is a very well-known martial artist and an American actor. His net worth is estimated to be $20 million. Most of his wealth can be attributed to his successful career as an actor, since he is one the greatest stars of action movies in the 90s. Steven Seagal was born on the 10th of April in 1952 in his hometown Lansing, Michigan. He was born to a family of a mathematics teacher and medical technician. Steven moved to Japan at the age of 17 and only came back to the United States after 15 years. It was in Japan that Seagal first started practicing aikido and Shito-ryu. Upon returning to the United States Steven Seagal opened a dojo. The second dojo that he opened was in Burbank while the first one was in New Mexico. Seagal became a producer by making his first film called Above the Law, released in 1987. He later went on and came up with three other films, which made Steven a Hollywood star. His biggest movie was called Under the Siege released in 1992. The film made Steven rich because it earned about $156 million internationally. Steven’s directorial debut could be considered to have been the movie called On Deadly Ground. In this very well-known 1994 movie Steven explored such themes as spirituality and environmental issues. Another one of Steven’s big hits was the 2001 movie called Exit Wounds. It was so successful that it grossed over $80 million dollars worldwide. Although most action and martial arts movies fans don’t know this interesting trivia fact, Steven Seagal is a guitarist and even plays in a band, and has even released two albums. More recently, Steven has been busy with his reality television show called Steven Seagal: Lawman. Another interesting fact is that Steven Seagal is also a reserve deputy sheriff. His extensive training in martial arts comes in handy, as Steven also has a good knowledge of karate, kendo and judo. He is considered to be the first so-called Westerner to have opened a school that teaches martial arts in Japan. 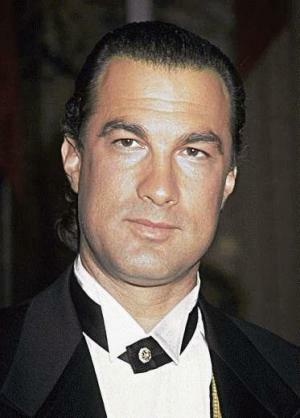 Speaking about his personal life, Steven Seagal has been married once, to actress Kelly LeBrock. They are divorced now. The couple met while Steven was working as her bodyguard when he was younger, and as he started making money while he was struggling to open his first dojo. Since Steven needed stable income, he was worked as a bodyguard for various celebrities. He became a celebrity himself by asking one of his clients, Michael Ovitz, for help. Michael gave Steven contacts of someone famous Hollywood personalities, and immediately after making a call Steven had a deal for his first martial arts movie. Currently Steven Seagal is on tour with his band. The band has covered many songs and has performed with such stars as Tony Rebel and even Stevie Wonder.